Last day Pro-Agent account promotion ! Apartment-Penang.com currently doing a promotion on Pro-Agent Account for the new sign up for the period of 15th Oct - 31st Oct 2013. During this promotion period, customer will entitle a discount on Pro-Agent account for only RM200 one year subscription with 25 premium ads and unlimited posting for non-premium ads (basic ad). Our normal price for Pro-Agent account valued at RM500, sign-up now to save RM300 during this promotion period. 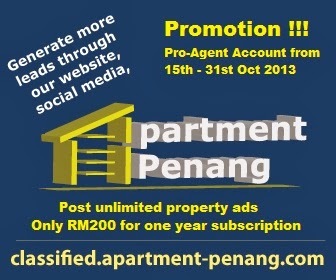 Post your ads now at Apartment Penang Classified.